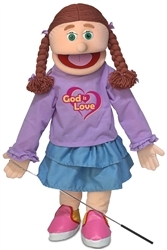 Silly Puppet # SP2801R Amy / God Is Love girl full body puppet. Performance size/style puppets make great gifts and are great for puppet ministry at church. Beautifully made with great attention to detail.